ADHRB welcomes the report of Special Rapporteur Aguilar and we share your concerns. We would like to bring attention to Bahrain and the case of Dr. Abduljalil al-Singace, a prominent human rights activist, engineer, and blogger serving a life sentence for his activism. Dr. al-Singace suffers the effects of childhood polio, which has resulted in partial paralysis and confines him to a wheelchair. During his imprisonment, Bahraini authorities tortured him, even using his disability against him to enhance his suffering. Since his imprisonment, Dr. al-Singace’s health has sharply deteriorated, yet prison authorities deny him medical treatment and refuse to provide him with equipment such as rubber stoppers for his crutches, resulting in falls on prison floors and ridicule from prison staff. We also want to highlight the case of Mahdi Kuwaid, who suffers from a developmental disability. He was arrested along with his brothers and despite being informed of his disability, officers beat him in the middle of the street. Mahdi was taken to the al-Hoora police station where he was tortured to coerce a confession. Mahdi remains in Jau Prison, serving a two year and nine month sentence. 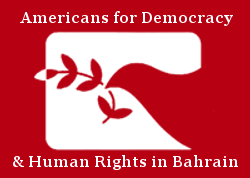 Bahrain continues to disregard its international treaty obligations by abusing disabled prisoners and disregarding prisoners in dire need of medical treatment, which puts others at risk of developing disabilities due to medical neglect. We therefore ask, what steps should be taken to address the ongoing violations of persons with disabilities in Bahraini prisons, and how can the Council ensure their protection? We have received reports that due to medical neglect in Jau prisoners of conscience have lost their vison or their eyesight has been affected negatively. Will you requesting to visit Bahrain to examine the prisons and their conditions?